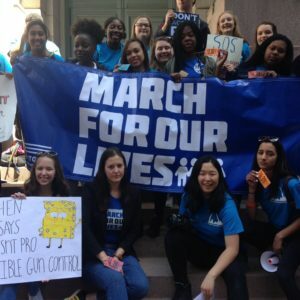 Students across the country, including in the St. Louis area, have participated in another National School Walkout Day to raise their voices against gun violence. The walkout coincides with today’s 19th anniversary of the Columbine High School shooting massacre. lawmakers to take action. Sunny Lu, the lead organizer, has a message for Hawley and other lawmakers. “Our legislatures, our Representatives, our Senators, like need to be aware that their constituents, their future constituents, their future candidates are going to be caring about this issue. We want to advocate for change now,” Lu says. Tali Gorodetsky, a student at Marquette High School, says the Parkland school shooting inspired her to get involved. “In February, I was in Orlando for a convention for my youth group. One of my friends, I was with him when he got a call from his parents and found out that his cousin Jimmy Gutenberg died in the Parkland shooting. She was only fourteen. I had to sit there while he found out that his cousin had died,” Gorodetsky says. Last month, millions of students around the world walked out of school to protest school gun violence.